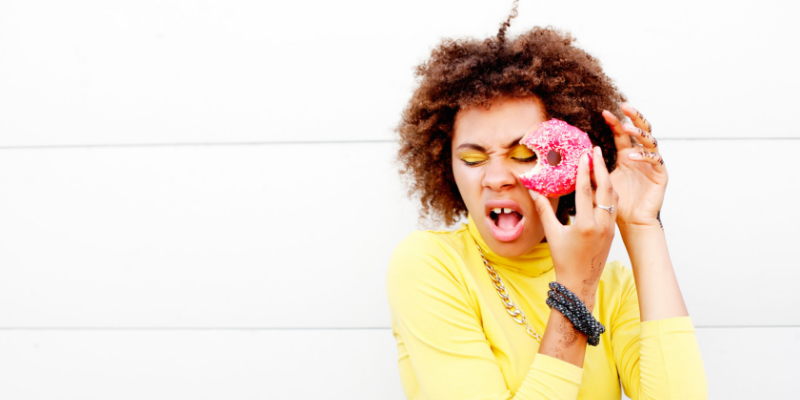 Beauty bloggers and celebrity nutritionists have used the term “sugar face” to describe the many negative effects that sugar can have on your skin. However, eating cakes and cookies isn’t the only way to get a case of “sugar face.” Stress can also cause an upsurge of sugar in your bloodstream, which can show up on your face in the form of wrinkles and breakouts. What Does Stress Have to Do with Sugar? Stress triggers our brains to release various hormones, including cortisol, which is often referred to as the “stress hormone.” Cortisol has a number of effects on our bodies, including increasing the amount of sugar in our blood. In a “fight or flight” situation, this extra sugar would provide you with a burst of energy. However, chronic stress causes increased sugar levels over a long period of time, which can lead to chronic health and skin problems, including diabetes, obesity, heart disease, and acne. Does Sugar Make Your Skin Age? Yes, sugar can cause premature lines and wrinkles. In a process called glycation, sugar molecules bind to and destroy proteins like the collagen and elastin that give your skin its smooth, youthful texture and its elasticity. When these proteins become damaged at an accelerated rate due to glycation, it causes your skin to age much more quickly than it normally would. Stress and sugar can also cause your skin to become dry and dehydrated due to inflammation. Dry, dehydrated skin can appear dull and more wrinkled than properly hydrated and moisturized skin. If dry skin is a problem for you, you may need a barrier repair moisturizer that uses MLE technology to replenish your skin’s natural lipids. Yes, sugar is one of dietary nutrients that have been linked with increased acne breakouts. Studies have shown that high glycemic index (high sugar) diets cause more pimples than low glycemic index (low sugar) diets. Because stress can also raise the glucose (sugar) levels in your body, it can cause breakouts in the same way. Because the stress hormone cortisol triggers a surge of sugar throughout your body, one way to get clearer, healthier skin is to lower your cortisol levels. To do this, you need to find ways to reduce stress, such as meditating, doing yoga, exercising, taking a walk outside, or using aromatherapy. Getting the right amount of sleep also plays a key role in stress reduction and your skin’s health. Studies have found that inadequate sleep can lead to an increased amount of cortisol the next day. Stress also tends to make us crave high-sugar and high-carb foods, so try to pay attention to what you’re putting on your plate, even when you’re feeling stressed. Eat fresh fruits and vegetables that have anti-inflammatory and antioxidant properties to help combat the unwanted effects that stress and sugar can have on your skin and body. Chronic stress has long-term effects on your body and skin, including a higher glucose (sugar) level in your blood. This can cause acne and wrinkles if left unmanaged, as well as adverse health conditions. Keep stress and sugar consumption in check for a healthier body and complexion. Stay up-to-date on the latest skin care news, science, and advice from Dr. Leslie Baumann by following Baumann Cosmetic on Facebook, Instagram, and YouTube. You can also sign up for our newsletter by visiting www.derm.net or emailing info@derm.net.